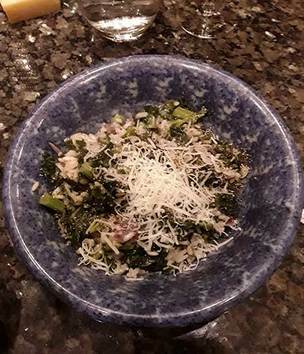 Risotto has an ubdeserved reputation for being difficult to make, yet it is actually quite straighforward. Kale is abundant just now and this is a tasty way to enjoy it. sausage with the onion works well. A bunch of 5 to 8 kale stalks is about right. I like to leave the ribs on as they give a nice crunch and for cooking, I use an elderly 2 litre Le Creuset enamelled cast iron casserole with a heavy lid. 1. Gently fry the chopped onion and garlic over a low/medium heat until the onion softens. 3. Make up the vegetable stock by adding 500ml boiling water to the stock powder. 4. Add about half the hot stock and the splash of wine if using, and give the rice a stir. 5. 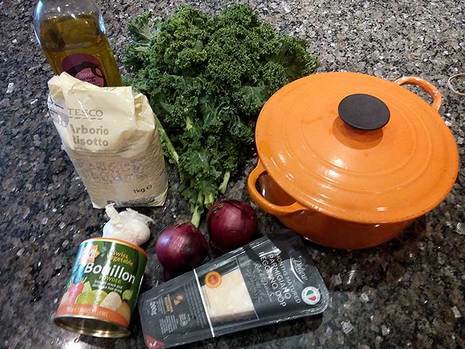 Add all the kale to the pan – or as much as you can force in! helps the kale to wilt down, so you might be able to add a bit more. you need extra, just use a splash of hot water to let the rice finish cooking. 9. Check seasoning, and add a good few turns of freshly ground black pepper. 10. Remove from heat. Stir in the parsley if using and grate in a generous amount Parmesan cheese - at least 15 swipes down the small mesh side of the grater – and stir in. 11. Serve in shallow bowls, passing round the block of Parmesan and the grater.